Gas Turbine Market Share - Segmented by Capacity (Less than 40 MW, 41-120 MW, 121-300 MW, Above 300 MW), Type (Combined Cycle, Open Cycle), Application (Power, Oil & Gas), and Geography - Growth, Trends, and Forecast (2019 - 2024). The availability of low-cost natural gas and intensifying environmental regulations have resulted in a shift toward gas-based power generation, which, in turn, is leading to the growth in gas turbine market. The need for clean power generating assets and decommissioning of aging power stations have further bolstered the trend. However, the increasing shift toward renewable energy sources, such as solar and wind, poses a major challenge for the growth of gas-based power generation. These renewable sources of energy are likely to hinder the market for gas turbines globally, during the forecast period. The power sector accounts for a major share in the market studied, with widespread application of gas turbines for power generation. The improvements in natural gas supply chain and power generation technology are expected to augment the share of the power sector, during the forecast period. In the recent years, the development of shale gas resources in the United States has led to the decline in the gas prices, allowing gas-fired and combined-cycle plants to play a crucial role in power generation in the region. The continued transition away from coal has resulted in increased investments in the gas-based power plants, thereby spurring the demand for gas turbines. Globally, Asia-Pacific has the largest market for gas turbines, with China and India being the hotspot for demand. The favorable government support, growing demand for electricity, and rapid expansion in the industrial and infrastructure development activities are some of the significant factors escalating the demand for gas turbines in the region. 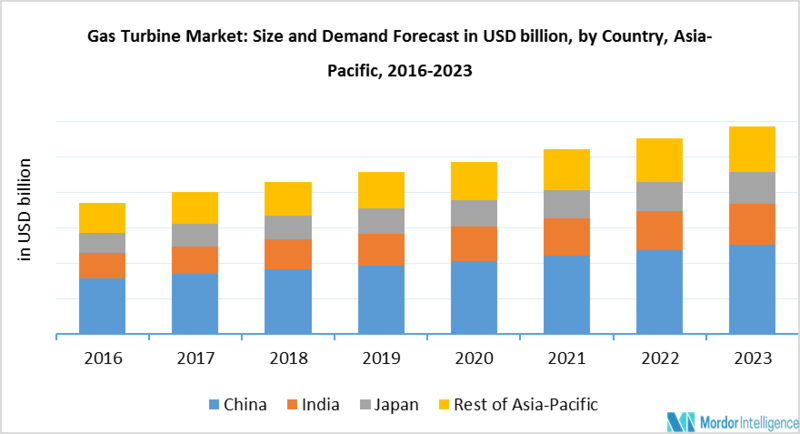 Additionally, the transition from nuclear power generation to gas-fired power generation presents a huge market opportunity for the growth of gas turbine market in Asia-Pacific. According to the International Energy Agency (IEA), the global natural gas market is expected to undergo a significant transformation, on account of new supplies coming from the United States, to fulfill the growing demand in developing economies. In 2016, natural gas had recorded a rapid paced growth in the North American region, as compared to oil and coal, owing to the boom in US shale gas production and the rapid LNG expansion. Moreover, the US shale revolution is poised to continue recording progress, and its effects are expected to be amplified by the rising LNG supplies. Therefore, the increasing growth in shale gas production and the rising demand for electricity are expected to drive the demand for gas turbines during the forecast period. February 2018: Siemens had agreed to engineer, manufacture, and commission a 41-MW SGT-750 gas turbine driving two DATUM compressors operating in a tandem arrangement for Statoil’s Johan Castberg FPSO in the Barents Sea. January 2018: The Power Services segment of General Electric had entered into a long-term agreement with a consortium formed by Macquarie Capital and Techint of Mexico for plant services at the Norte III power plant in Mexico. The project cost was estimated to be around more than USD 330 million. * List of companies is not exhaustive. Detailed list shall be made available in the full report.